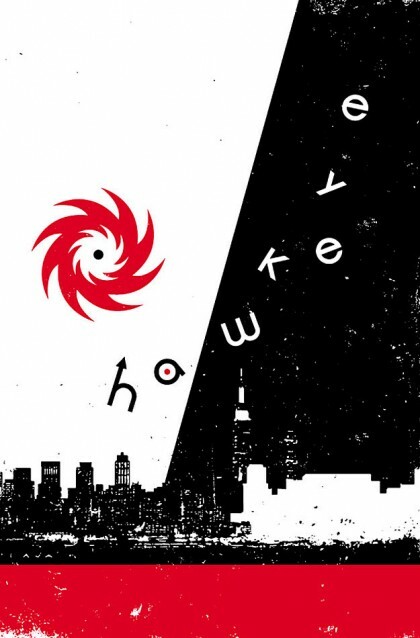 SETH’S PICK :: HAWKEYE #7: Aside from being one of the more unique superhero comics on the shelves, this week you have another, even better reason to give Hawkeye a try. 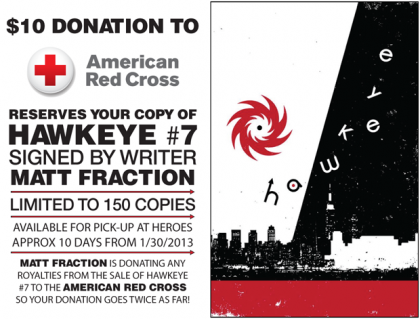 In the immediate aftermath of of Hurricane Sandy, writer Matt Fraction was moved to pen a story about the everyman Avenger dealing with those affected by the storm. This makes perfect sense, as the book is very much grounded in the actions of an ordinary man facing down big obstacles. If that’s not enough of a reason to check it out, it’s worth noting that Fraction is donating all of his royalties from this issue to the Red Cross. That means the more copies of the book that sell, the more money the Red Cross will get to help those in need. You can buy this book and know that you’ll be making a small difference in the lives of others. The other nice thing about this issue is that it’s kind of a jumping on point, so if you missed Hawkeye #1-6, you can still read this book and be on the ground floor. Hawkeye has become a regular sell-out for us, and for good reason. 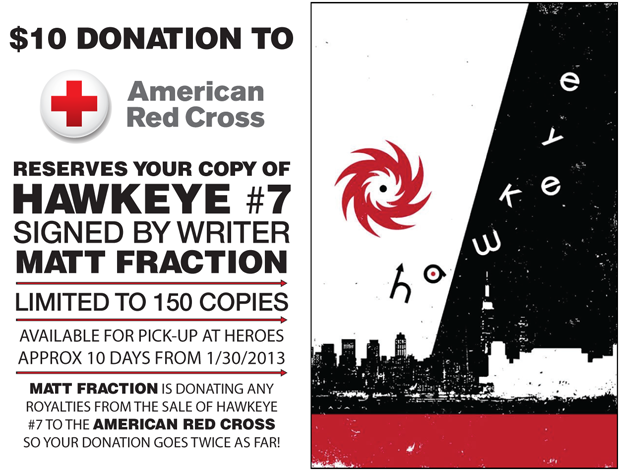 Pick this one up, read one of comics’ best superhero books, and help raise money for the Red Cross all at the same time. CHARLOTTE MINCON :: Give a little, get A LOT. Charlotte Mini-Con is fast approaching, and with all the “AMAZING” things we have in store for you, we’d also like to direct your attention to some of the wonderful charities that we will be hosting at Sunday’s show. Here’s a direct link for a FREE pass!